GILAS Pilipinas 5.0 gets the chance to play for the first time on home ground following the formal awarding of the 2016 Southeast Asian Basketball Association (SEABA) Championship hosting rights to the Philippines. National team coach Chot Reyes confirmed the hosting matter on Monday by announcing it on his Twitter account@coachot. The meet will be held from April 23-30, with the champion getting an outright berth to the FIBA Asia Cup to be held in Beirut, Lebanon in late August. Reyes said it’s always a welcome development for Gilas to play in front of the basketball-loving Filipinos. “Of course malaking bagay para sa ating mga kababayan.but for our players as well. It’s always nice to play in front of your home crowd,” said the national mentor during the presentation of the other 12 players who completed the 24-man Gilas training pool. Samahang Basketbol ng Pilipinas (SBP) executive director Sonny Barrios said the federation made in writing the country’s intention to stage the week-long meet through SEABA president Eric Tohir. “So unless we have it in writing, then it’s not yet final,” said the former PBA commissioner. 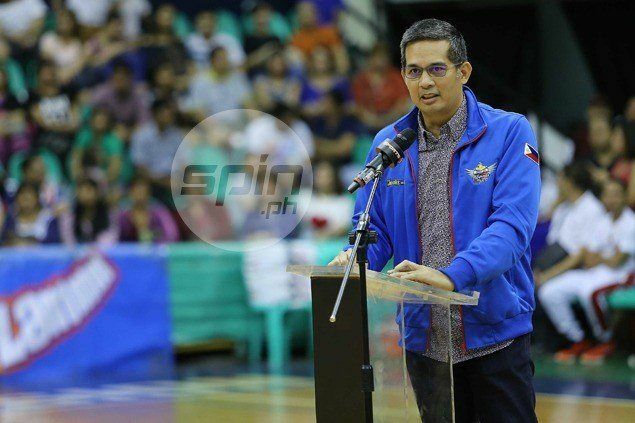 Barrios said the SBP had follow up the hosting rights last week since the national team’s preparation for the tournament would depend on where and when the SEABA will be held. “The earlier we prepare, the better,” said the SBP official.